Some may think Jesus Christ isn't mentioned in the Bible until the New Testament. Is that a correct notion? Definitely not. Is Jesus referenced in the Old Testament? Absolutely! He is there from the very beginning. Every foretelling about the lineage, birth, life, death, and resurrection of Christ the Savior can be traced and is fulfilled in the sixty-six books of the Bible. From the beginning to end, the Bible is His story -- one story, one plot, one hero. 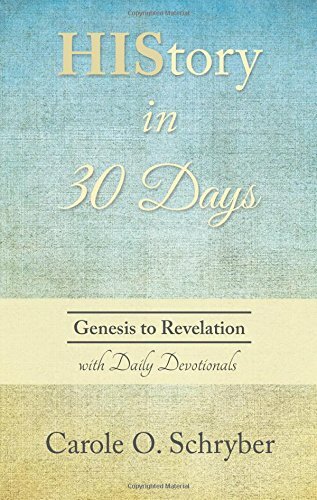 In HIStory in 30 Days; Genesis to Revelation, author Carole O. Schryber provides thirty daily readings, with devotionals and prayers. Written in an engaging, fast-paced, accessible style, you follow along as HIStory unfolds, and learn what part you're meant to play in it.